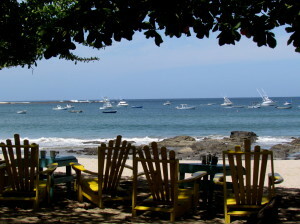 Marino las Baulas de Guanacaste Tamarindo/Playa Grande National Park has a history nearly as long and convoluted as its name. 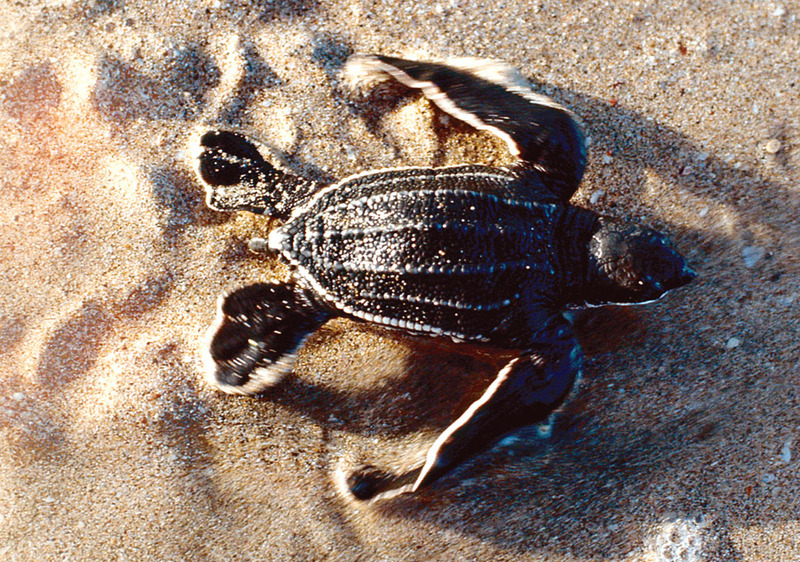 For thousands of years leatherback sea turtles that hatched at Playa Grande have returned to lay their eggs. 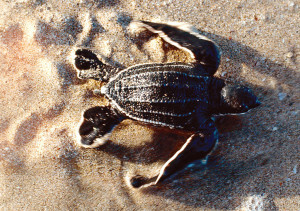 The park’s namesake leatherback turtles (baulas) are the largest marine reptiles and one of the most endangered. The advent of turtle nesting tourism has been a double edged sword. The money that tourists bring when they come to see the turtles encourages conservation, but the presence of people, and especially lights on shore confuse and disorient the turtles. Their numbers have dwindled over the decades. The first of settlers used their meat and eggs to supplement their diet but probably had little impact on the population. When the market for turtle eggs as an aphrodisiac moved in the nest raiding became more serious, but the real problems came with commercial harvest as an ingredient for factory baked cookies, and finally exportation to Asia as a delicacy. Credit for the birth of leatherback turtle conservation on Playa Grande is given variously to Louis Wilson and Marianel Pastor who began nesting tours from their Hotel las Tortugas training poachers as guides (previously after tours “guides” had returned to collect the eggs), and Maria Koberg who was a one woman crusade to bring friends, school classes, and boy scout troops to the beach so they could gain an appreciation for the turtles and the need for protection. Whoever the parents of the movement were it resulted in the declaration of a National Park in 1990, and continuously improving protection for the turtles ever since. Tourist dollars have provided the impetus to protect these impressive creatures, and egg harvesting has been nearly eliminated, but the numbers continue to decline. Adults being caught accidentally and drowned in shrimp and fishing nets account for much of the current attrition. It’s also been shown that plastic grocery bags can make up the majority of the stomach contents of adults. They mistake them for their favorite food – jelly fish – and eventually eat enough to prove fatal. All nighttime tours are preceded by a brief educational presentation, and led by rangers who will help you minimize your impact. A small museum and interpretive center at the main entrance of the park focuses on the natural history of leatherbacks, and audio tours are available in several languages. Marino las Baulas is not as closely monitored or regulated outside the peak viewing season, and you may find yourself alone on the beach. Please do not use unshielded flashlights or camera flashes, don’t walk on the sand above the high tide mark, make loud noises, or approach too closely. And of course never buy turtle eggs or products made from turtles. The mangrove swamps and estuaries protected by Tamarindo National Wildlife Refuge adjacent to Marino Las Baulas are a perfect spot to spend an afternoon exploring in a sea kayak. During daylight hours, walking and surfing are allowed on Playa Grande and the northern shore of the estero palo seco. Please be careful to avoid the dry sand above the high tide mark, as this is where the turtles lay their eggs. The frigate birds, brown footed boobies, pelicans, and other waterbirds are the main attraction, and monkeys are common, but as conservation takes hold, it is becoming easier to spot ocelots, crocodiles, and anteaters. 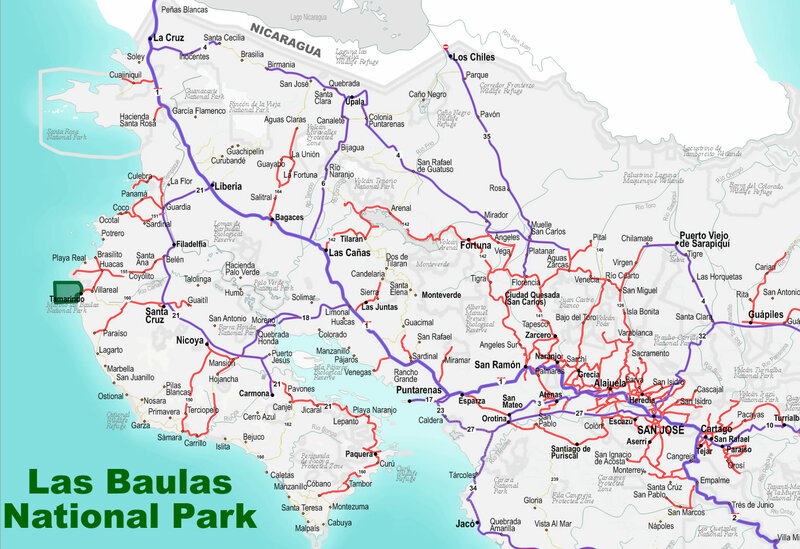 Hotels, ecolodges, restaurants, and more on a detailed, accurate, printable map of Tamarindo (Tamarindo is in the middle of Marion las Baulas National Park). Click the image above to go to the attachment page where you can choose either a large jpg version or the full resolution printable PDF map download of Tamarindo compliments of Costa Rica Guide and Toucan Maps Inc. Size – 1,100 acres (445 hectares) of beach and coast, and 54,400 maritime acres (22,000 hectares). The land portion is a little bigger than central park, NYC. Established – Marino Las Baulas was established by presidential decree in 1990 and protected by legislation in 1995. Habitats – Beach, coral reef, and mangrove.